I hope you all had a happy and peaceful Easter. I finished my latest painting before Easter and put it up on the Gallery page – and then got a nasty virus and didn’t get a chance to mention it! This is a view from the seawall at the far end of the Naze at Walton, looking inland. I made the drawing in the Autumn, but recently did this walk again and remembered that I’d never got round to painting it! 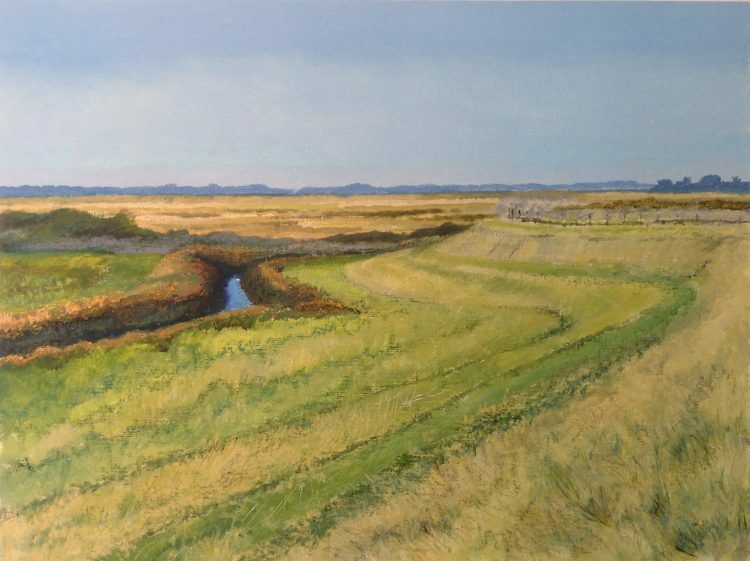 I liked the way the sweeping lines of the marsh ditch, the various coloured vegetation and the seawall itself all swirled around and made such a pleasing pattern. I may do a Spring picture of this from my walk a couple of weeks ago, as although the structure was obviously the same, the colours and vegetation were completely different. This is the latest in my occasional series, Landlines – paintings of anything natural or man-made which makes lines in the landscape. On the Tuesday before Easter – just before I got ill! 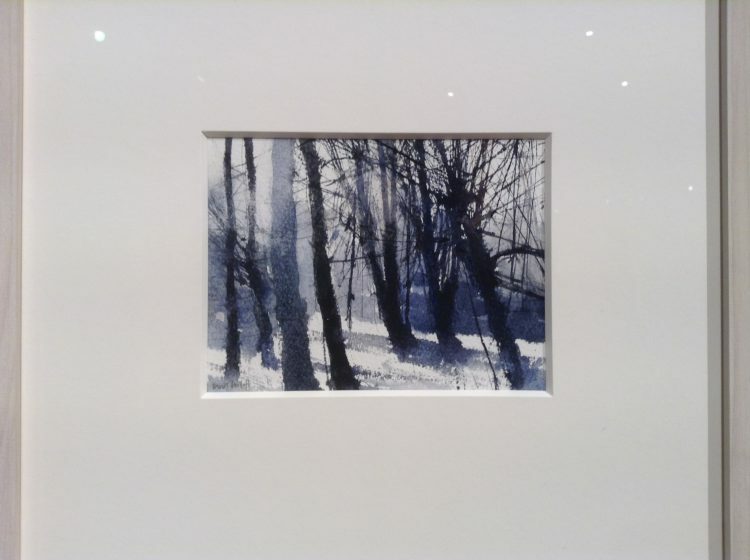 – Graham and I went up to London to the Mall Galleries to see the Royal Watercolour Society’s exhibition, which was excellent. We have yet to see an exhibition at these galleries which has fallen below our (very high!) expectations! Although the show has finished now, I thought I would mention some of my favourites so that you could google the artists if they interest you. 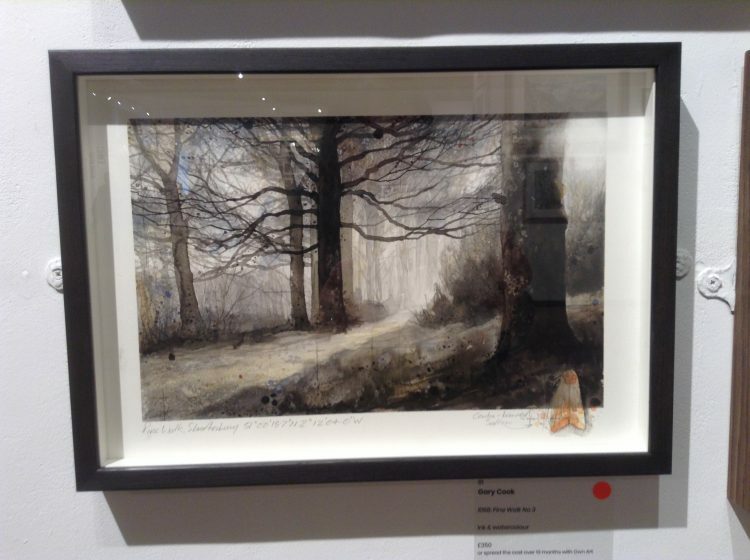 I think my very favourites were these two paintings by Gary Cook. I follow Gary Cook on Instagram where you can find him @cookthepainter if you like his work. In my Studio: I’m just starting a painting of Wittenham Clumps, which I explored on the summer solstice last year. It was during my week walking The Ridgeway, but of course it didn’t really fit in with that series, so it’s actually going in the Landlines series. You’ll see why when I’ve finished! 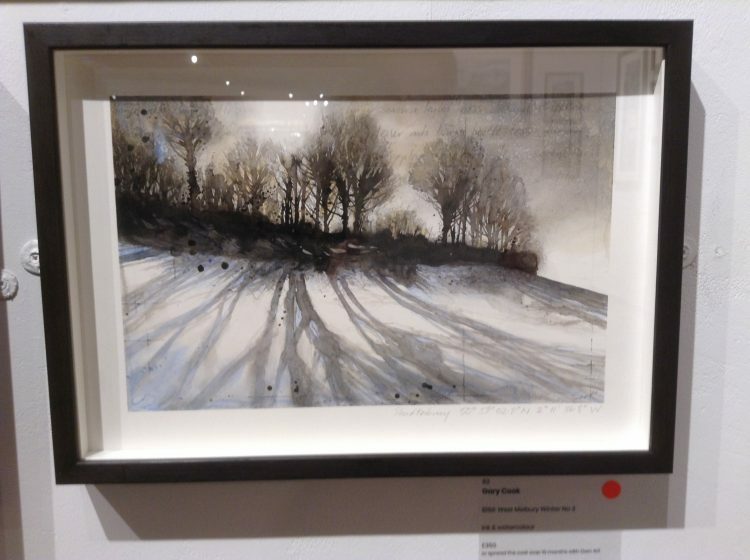 I’ve just chosen a new type of frame for my On the Edge series. Nothing drastically different, but I just felt like a bit of an update would be good. It’s still white, but matt with a very slightly textured surface and a good profile. 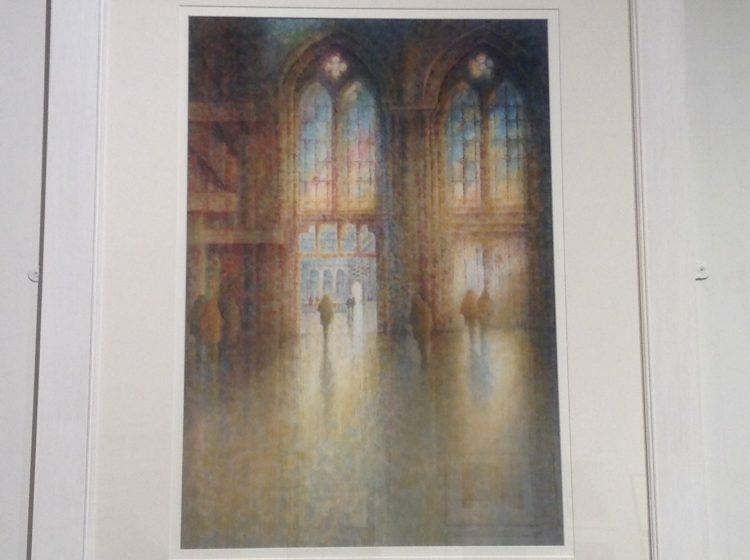 I have one frame on order as a tester, so I’ll post a photo when I’ve framed the first painting. I have three visits planned for this project before the end of May – St Osyth, Bradwell and East Mersea – so lots to get on with! I will be sending out my second email newsletter on 30th April with some exciting news about the Anglian Arts Project. Sign up to receive newsletters at the bottom of my Homepage if you are interested. 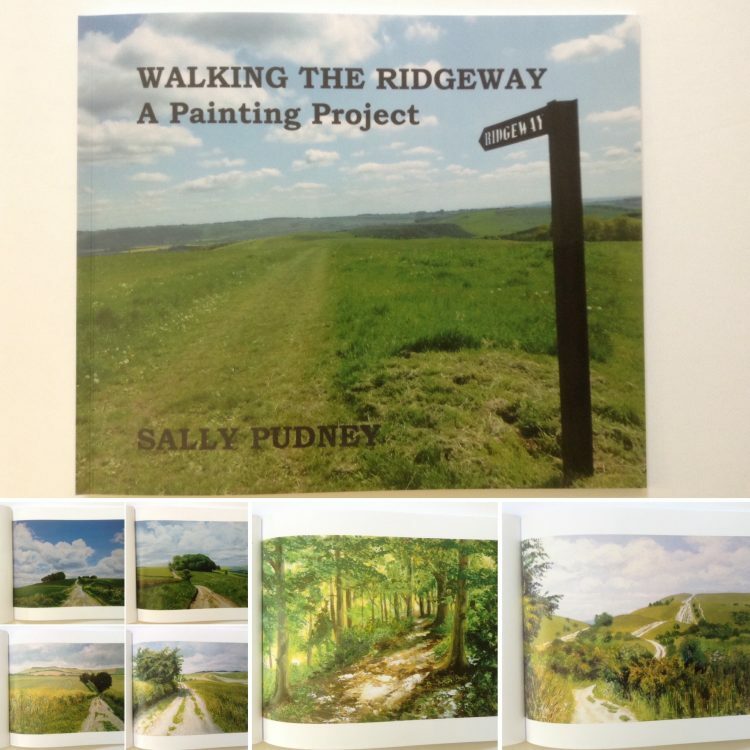 New in the shop this morning – the book of my Ridgeway painting project! This shows you a few of the pages! Each of my twelve Ridgeway paintings is shown with some notes about things I saw and heard at each location on the facing page. 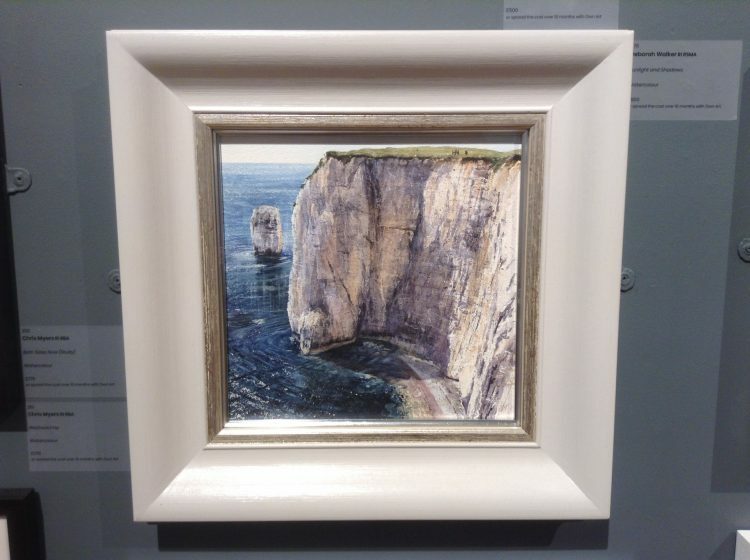 The paintings are shown in geographical order – not the order in which I painted them. That took a bit of working out, and studying the map in my Ridgeway guide book! There is a short introduction, and a short ‘Afterword’ – and the final sentence will only make sense to you if you’ve read Robert Macfarlane’s The Old Ways . 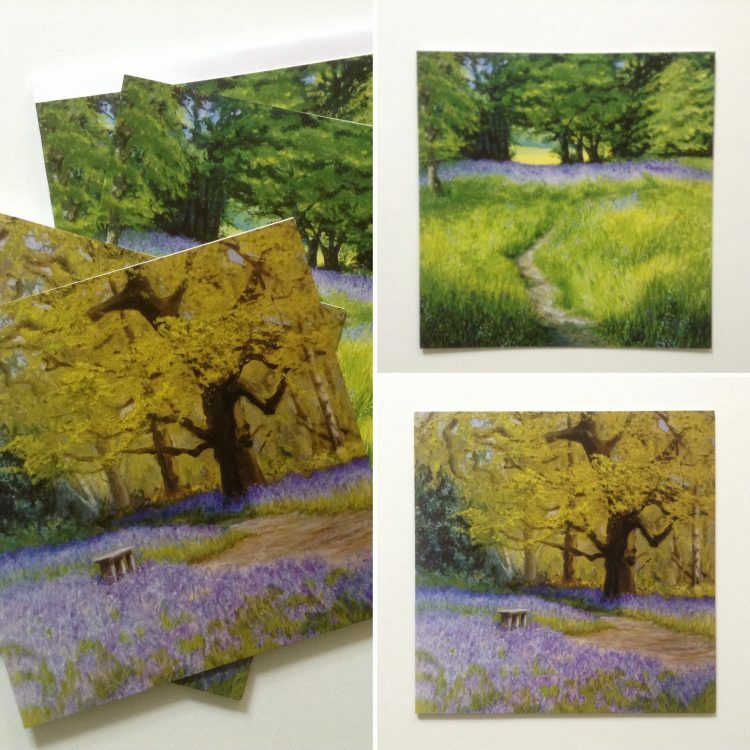 . .
It’s in my web shop now, priced £20.00 which includes packing and postage to any UK mainland address. In my Studio: I’ve almost finished the next painting in my On the Edge project, so watch out for that going up on the gallery page in the next few days. I’ve also decided to update my framing for this project, and have ordered four samples from Framewerks to choose from. They are all still white, so nothing too drastic – but I just felt a bit of a change of profile might be good. I’m looking forward to seeing them when they come. It’s been a really busy musical weekend here, with Graham performing in a wonderful concert of Gounod’s St Cecilia Mass, and other music by Faure and Franck on Saturday night, and both of us performing in excerpts from The Messiah at All Saint’s church in Maldon last night. 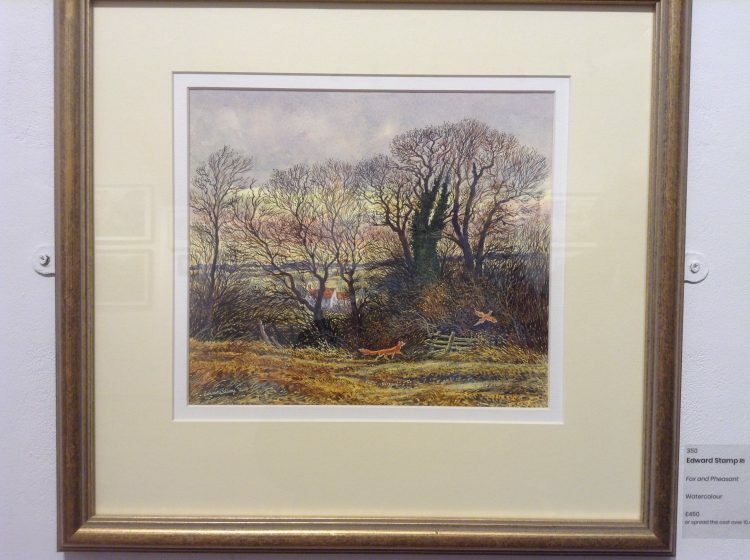 I’m looking forward to a relaxing fun day tomorrow as we’re going up to the Mall Galleries to see the Royal Watercolour Society’s show.